This vinyl only release is the first in German label Happy Zloty's limited edition Splitting Series. It's a similar idea to the Fat Cat series of 12"s - the two improvising trios Perlonex and Julijuni are each given a side apiece. Perlonex are Ignaz Schick on various objects, turntables etc, Jörg Maria Zeger on guitar and Burkhard Beins on percussion, all musicians who are active in various other improvising contexts. The Perlonex side begins with a drone and delicate, looping guitar arpeggio before heading into a post-industrial, post-AMM landscape full of feedback, clanking chains and unidentifiable scrapes and thuds. The piece gathers density as it moves along, becoming a thickly matted assembly of sounds, with a guitar loop as a constant. Perlonex are a cohesive unit and they all pull in the same direction when they play, producing a commited and intense piece of group communication. Julijuni's sound sources are Powerbook, feedback and guitar, coming from Michael Rieken, Tim Tetzner and Ansgar Wilken respectively. As with Perlonex, recognisable guitar sounds are set against abstract, untuned noises. The music is light-footed and shifts readily from episode to episode. Their sense of space steers them away from thick textures (...). Happy Zloty is a small German label who has released a whole bunch of loveable and collectable 7" with improvised music in nice silkscreened covers. Now they move away from the handwork of glueing 7" covers with the release of their first split LP. Of course in a silkscreened cover... On this LP we find two improvising bands from Germany. The a-side has Perlonex, a trio with Ignaz Schick on electronics, devices and turntables, Jörg Maria Zeger on guitars and Burkhard Beins on drums and percussion. They have two CDs on Zarek (see Vital Weekly 235 and 286) and a 7" on Bad Alchemy. Like I wrote before, it's hard to tell wether the music of Perlonex is entirely improvised. I once saw them play live and noted the tight playing, which seemed kind of planned out. Not that it mattered that much to me, because it was a great thing to hear. Perlonex combine various styles of music in their own music: it's a bit of noise, electro-acoustic, ambient, composition and improvisation, that is brought together in very intense and powerful pieces of music. On the other side we find Julijuni, a Berlin/Hamburg trio of Tim Tetzner on feedback, Micheal Rieken on powerbook and Ansgar Wilken (boss of Happy Zloty) on guitar and electronics. They exist since 2001 and their first rehearsal was also their first gig. Since then they have played all over Germany and The Netherlands (they say: I didn't see them). 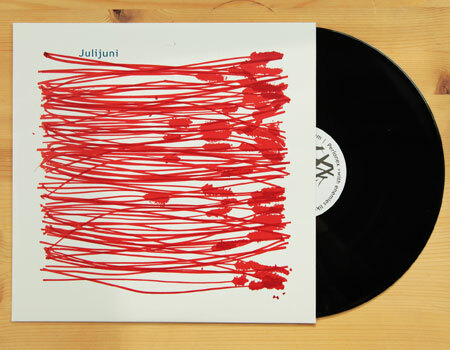 Julijuni operate indeed in a much more improvised music style and they opt for the more noisy side of improvisation. Their piece (although divided in three parts, it sounds very much like an ongoing thing) starts out nicely in a moody way, but gradually builts up to a wall of noise, feedback and extensive scraping of contact microphones. Das Berliner Trio Perlonex, besetzt mit Ignaz Schick (electronics, devices, turntables), Jörg Maria Zeger (processed electric guitar) & Burkhard Beins (drums, percussion, objects), steuert mit dem knapp 18-minütigen 'with enemies like these who needs friends' einen ihrer typischen Spannungsbögen bei, eine aufwallende, dichte Klangwolke, die wieder sanft am Horizont verschwindet, ein Naturereignis, konstuiert mit sorgfältigster elektroakustischer Finesse. Dass sich ihre im Mai 2001 in Bremen formierten Splitpartner nur eine Lebensdauer bis Julijuni zutrauten, erwies sich als Irrtum. Gitarrist und Labelmacher Ansgar Wilken, Tim Tetzner (feedback) & Michael Rieken (powerbook) tanzten nicht nur einen Sommer lang, vielmehr beschallten sie die Hamburger 'Hörbar', das 'Sonorama' in Arnhem, mit feinen Knirsch- und Knispel - Soundscapes. In einem diffusen Geräuschstrüpp rumoren elektroakustische Simulacren von organischem Wildwuchs. Die Suggestion von 'Leben' ist so stark, dass man Tapetenmuster, Teppichknoten und Zimmerpflanzen kritisch zu beäugen beginnt nach Anzeichen von Gekrabbel. Dabei muss man keine mimetische Absicht unterstellen. Aber die Akribie, die dieses Trio ins Detail investiert, transformiert den Hörraum so plastisch in ein hybrides Zwischenreich aus kristallinem Knistern, insektoider Zirb- und Schabaleatorik, motorischen Geräusch- und automatischen Repetitionsmustern, dass die schroffe Trennung zwischen dem Realen und und Imaginärem etwas weniger schroff erscheint.